Today I turned on Verizon’s HD Voice feature on my iPhone 6 using Verizon’s Wireless’ Prepaid BYOP plan. With HD Voice my phone now supports Voice over LTE, Wi-Fi Calling, simultaneous voice and data, and up to 6-way conference calls. With HD Voice I’ll get higher fidelity sound when talking to other people that are also using Verizon’s HD Voice. With simultaneous voice and data, I’ll be able to talk on the phone and use data at the same time. With Wi-Fi calling, Verizon can route my calls over my Wi-Fi network when you have Wi-Fi service but your cellular signal isn’t strong. This is a big deal because up until September 25, these features were only available on Verizon’s post-paid network and not the prepaid network. 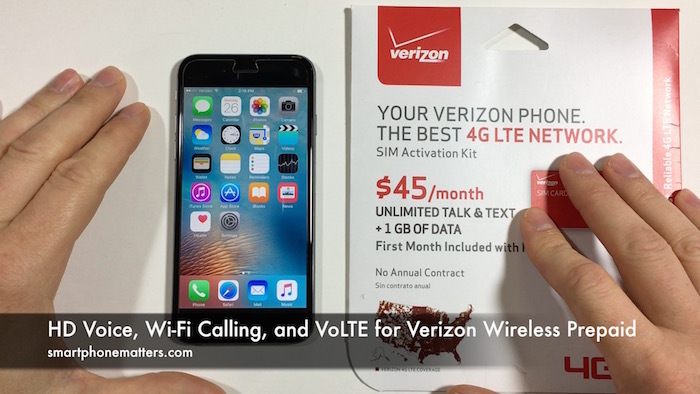 In fact, I recently made a video showing that I was not able to use Wi-Fi calling with my iPhone 6 with Verizon Wireless Prepaid because HD Voice was not supported. Today, I tried again and was able to enable HD Voice. Here is what I had to do. Choose Voice and Data if its not already selected. Before I enabled HD Voice in My Verizon, I tried to enable Voice and Data but got an error message telling my to contact Verizon to enable this feature. After turning on HD Voice, the Voice & Data option was automatically enabled. Now from Settings, I enabled Wi-Fi calling. When I turned on Wi-Fi calling, a screen popped up requesting my address. Wi-Fi calling needs your address so it knows your location when you call 911 emergency services. After turning it on, there was now an option to update my address. Once I got all this set up, I decided to test Wi-Fi calling and simultaneous voice and data. To get my phone to recognize Wi-Fi calling I turned on Airplane Mode and then Wi-Fi. This disabled my cellular service. In about a minute my phone’s status bar changed from Verizon to WZW Wi-Fi indicating my calls would use Wi-Fi. I made a test call to make sure this worked. After trying Wi-Fi calling, I decided to try Voice and Data at the same time. I turned off Wi-Fi and Airplane mode. After making a call to my other phone, I still had an LTE connection. Now I was able to tap Safari and browse the web while still on a phone call. All of this is very cool and brings these advanced features to Verizon’s Wireless’ prepaid network.